Onychomycosis is a fungal nail disease that accounts for 40% of all nail disorders, affecting 1 out of 10 people at some stage in their lives. Compiled by leading dermatologists with expert knowledge of the condition, Onychomycosis: Diagnosis and Effective Management provides a clear and clinically focused reference tool for those looking to treat patients expediently and successfully. Onychomycosis is a reliable, easy-to-use companion for trainees and experienced specialists alike, and an invaluable asset to any clinic treating nail conditions. DIMITRIS RIGOPOULOS, MD, is Professor of Dermatology and Venereology at the Medical School, National and Kapodistrian University of Athens, Athens, Greece. BONI ELEWSKI, MD, is Professor and Chair of Dermatology at the University of Alabama, Birmingham, AL, USA. BERTRAND RICHERT, MD, PhD, is Professor of Dermatology and Clinical Professor at Brugmann St Pierre and Queen Fabiola Children's University Hospitals, Université Libre de Bruxelles, Brussels, Belgium. Onychomycosis probably has more "treatments" than virtually any other dermatological condition. Why? Because there isn't any one treatment that is 100% effective or even works the majority of the time, even when using it for a year! Fungal nail infections are inherently frustrating to cure and have always been a difficult and often impossible endeavor for dermatologists. This book covers every imaginable treatment, including those with little supporting data (the authors state this when it applies). The purpose is to educate dermatologists on all current approaches that are available for treating onychomycosis. Limitations and risks of each therapy are reviewed. Laser, topical, and systemic medications, surgery, and home topical remedies are all discussed. There are numerous photographs, but, unfortunately, most are not in color. There is a therapeutic algorithm for guiding readers in choosing a reasonable treatment path based on clinical presentation and prior drugs used. Tables listing criteria for a surgical approach, oral antifungal medications, and predisposing medical illness that contribute to making clearance more problematic are helpfully included. There are photographs showing clinical appearance of infected toenails from different dermatophtyes and nondermatophyte molds. Tips for using the dermatoscope for confirming onychomycosis are discussed. Surgical debridement is covered in detail. One would be able to perform the procedure after reading the book. 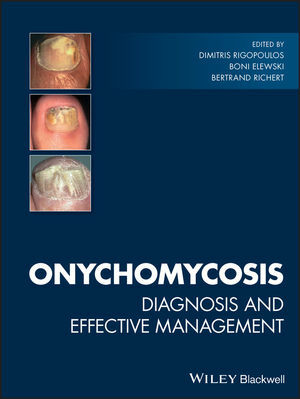 This is the definitive book on diagnosing and treating onychomycosis. The latest research and practical expertise from experts specializing in onychomycosis are neatly presented in one package. Other books do not cover the subject as extensively -- onychomycosis is generally tacked on as a chapter in a nail disorder book.